← It’s true. Sometimes I AM a little embarrassed. 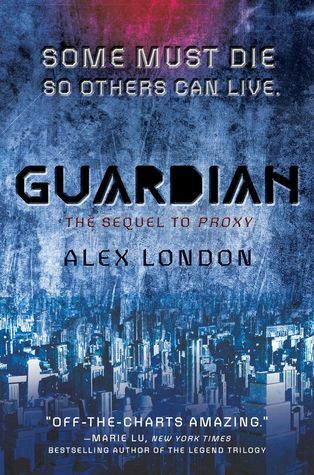 This entry was posted in Book Reviews, Dystopian, Science Fiction and tagged Alex London, Book Discussions, Book Review, Dystopian, Guardian, LGBT, Proxy, science fiction, YA. Bookmark the permalink. Hahaha yeah “Liam… Swoon” indeed! Like you I was a little worried about his Yovel-devotion at first — and I was glad he began to see things the other way later. I think everyone has a little bit of Marie in them at some point of their lives, especially in those early years (well, at least many people I know, myself included). I agree that something personal is usually involved towards our journeys of realization… And it’s not always pretty, but it’s always a beautiful journey. The part where you said Syd learns to face the future, Liam the past, and Marie the present really hits me. It’s a genius point — it was really there, but I’d never thought about it that way. And the villain. Oh, that villain. I kind of want to know more about him, but I’m not sure if I’m prepared for the kind of nasty he is. I’m yet to read Yaks. Hope to find time soon! Hahahah what can I say? Basically I’m a book dissecting genius 😉 No actually, I hadn’t considered that point myself until I had a chance to chat it out w/my family.. Something about coffee & mountain air? (In truth, my sister and mother are teachers so I’m pretty sure all the true insight into this series came from them).